You might have already heard this a couple of times from your parents, grandparents, or other older people. Since we are kids, we are taught to thoroughly rinse our mouth with water right after brushing our teeth. If we fail to do so, the toothpaste may destroy our teeth. The fact is, you should not rinse your mouth with water right after you're done brushing your teeth to avoid washing away the certain layer of fluoride. Many people strive to make their teeth stay white. These people believe that the whiter the teeth are, the healthier they are. The fact is, the color of the teeth is not always a good indicator of oral health. That is, having sparkling white teeth does not always mean that your dental health is in excellent condition. Although having white teeth ensures you that you have no inner-tooth issues as most of these problems noticeably stain the teeth, having white teeth can mean that they have excessive fluorides. To ensure the optimum oral health, schedule a visit to your dentist and have your teeth checked and cleaned at least one in every 6 months. Your dentist will most likely use magnification instrument like the Schultz dental loupes to see if there are any inner-tooth issues developing or if your teeth have excessive amounts of fluoride. Many people believe that dentists are providing oral health just for money. They do not truly care about the oral health of their patients. They just do whatever is necessary to fix their patient's oral issues and when they are done, they go accommodate the next patient in line. They don't even have time to explain things to their patients. The fact is, dentists, care for their patients more than you can think of. Dentistry is not always about money and earning as big as you can. It is more of providing health care services to their patients, making sure that everyone will have a pretty smile and a good quality life. In fact, in most cases the moment you step on the dental office door, the dental team and staff will ensure that you are comfortable and well accommodated until the time you meet with the dental hygienist or dentist. Dentists, in general, want to share as many helpful information as possible to their patients. 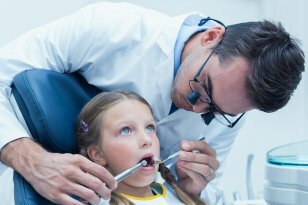 That is why they explain every procedure and treatment they are doing so that the patient will have an idea how the procedure or treatment can help their oral health. This entry was posted in Dental loupes daily tips | Schultz Dental surgical blogBy Roger Jing On Mar 01, 2018 .